displays to TV, Projector, car screen and other large screen, enjoy the big screen fun..
Plug HDMI and USB into ports. Set your TV to the HDMI port you picked. show, but once you tap it your iPhone/iPad screen will now be cast to your TV. 1. The Anycast dongle must be powered by 5V/1A power adapter or USB. 2. In order to have a good use experience, you had better read the User Manual before use. 3.It can not mirror videos from the apps that require copyrights such as Netflix/ iTunes/ Amazon Video/ HBO go/ Hulu Plus/ Honda Motor/ ESPN. Stable Signal-The upgraded Dual Core supports Play more stable and Fluently,Unlike old versions dongle,this latest version support DLNA, AirMirror, Airplay, Mircast to sync cast photo /video /music/office file/web browser/live camera from iPhone/Android Smart phone/tablet PC to large screen TV/ Projector,and more importantly it support Youtube. Very Easy to use & operation-No need driver and app installation.The upgraded Dual-core supports Play more stable and Fluently and easy to use.Only 3 steps to enjoy media on large screen: Plug->Connect->Mirroring by using Miracast, Ezcast, DLAN and Airplay. Compatible With Different Devices -IOS 8 / Android device 4.4 and above Need Supports Miracast / Windows 8.1 and above / MAC 10.9 and above. Broad Application: The HDMI WiFi Wireless Dongle stick will supports mirroring of what is displayed on your device screen - including apps, presentations, websites, web surfing, slideshows, live camera and more - to your HDMI-equipped TV, display, projector or other compatible display in up to 1080p HD, through Wireless connection, under the popular standards Miracast, DLNA, Airplay and Airmirror to enjoy excellent multi-display sharing. 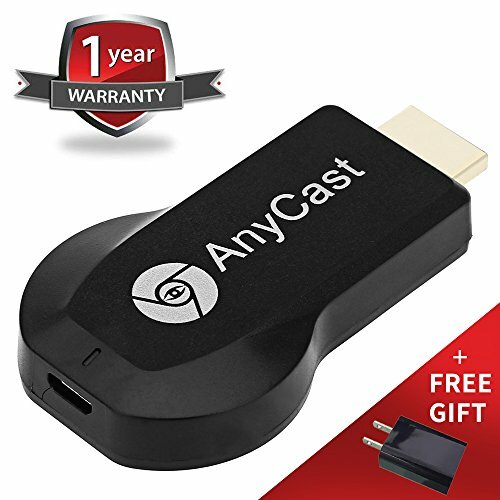 Lifeproof Quality Guarantee: Anycast Dongle is backed by manufacturer 30-day money back guarantee with a 1-year warranty and our support team will reply within 24 hours for any technical support to ensure excellent customer experience. If you have any questions about this product by DHbox, contact us by completing and submitting the form below. If you are looking for a specif part number, please include it with your message.